This chapter identifies the key contributions of the book and reflects on ethnography as an approach to studying legal actors, communication and decision making. In terms of contributions, the book highlights the messy, contingent, discretionary, unreliable, inconsistent and unjust processes through which legal doctrine is translated into bureaucratic practice in the context of large scale, international asylum decision making systems. In particular the book explores two central axes of tension: between fairness and efficiency, and between consistency and variety. In terms of the effectiveness of legal ethnographies, the chapter argues that the ethnographies contained within the volume amply exemplify the standards of excellence that the literature on ethnography suggests that we use to evaluate ethnographic work. The country coverage of this volume is by no means exhaustive. The ten European countries that form the basis of the ethnographic case studies reported are not intended to be representative of Europe in any statistical sense, especially considering the absence of former communist countries located in Eastern Europe. The selection reflects a number of factors, including the location of ethnographic projects that examine asylum determination and have been carried out in Europe, the editors’ knowledge of these projects and abilities to attract responses to calls for chapter contributions to the volume, and the access to asylum determination systems that ethnographic work requires. Rather than positing that the volume explores the full extent of the variety of everyday practices that are bound up in asylum determination in Europe then, it is perhaps more accurate to claim that the book is suggestive of the extent of that variety. One consequence of this is that the volume clearly highlights the importance of further research into the sorts of issues that have been raised. 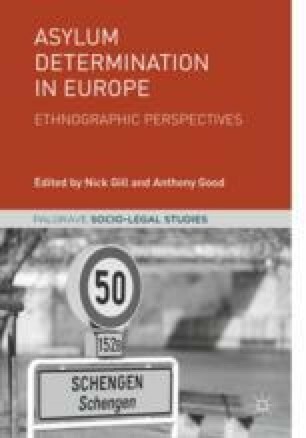 Hopefully therefore, the book will stimulate and encourage work that ethnographically explores further aspects of asylum determination, both thematically and in countries not discussed in this volume. Thematically, aspects of the determination process that deserve closer scrutiny include the exceptional ‘fast track’ processes that many European countries implement alongside their regular procedures; the differing interpretations—not only in legal doctrine but also on the ground—of key terms like ‘vulnerability’ that often serve to regulate entry to fast-track procedures; the means of progression of some cases to the higher courts as well as the role of strategic litigation in facilitating this progression; and the sociology and economy surrounding the generation of ‘knowledge’ about source countries, for example through country guidance information. In terms of countries, certain states periodically distinguish themselves in the treatment of asylum seekers and refugees. Sweden, for example, accepted a very high number of Syrian refugees in 2015 and 2016 in relation to its population whilst Hungary and other Eastern European countries were far less accommodating. The Hungarian government’s continuing aggressive stance towards NGOs that are deemed to be supporting migration make maintaining academic scrutiny of these issues paramount (EU Observer 2018). Moreover, Turkey has been deployed as part of Europe’s remote control asylum strategy since 2015 via the EU-Turkey deal, raising grave concerns about human rights violations not only within Turkey but also on the Greek islands which have become places of routine detention and deportation (Amnesty International 2017). Given that the Turkey deal emerged at a time in which Europe as a whole was seen to be struggling to cope with the numbers of migrants arriving, this development reflects the central role of failure itself in the justification, production and development of systems of governance, including those of asylum (Foucault 1991; see also Vianelli 2018). Further outside Europe, the volume begs the question of how to compare Europe’s asylum determination processes with those in other developed countries, as well as in developing country contexts. Making comparisons with the ways refugee law is experienced and implemented in Australia, Canada, New Zealand and the US, for example, would allow a general picture to be formed of the degree to which international refugee law functions to practically protect, or exclude, refugee populations in developed countries. And given that the overwhelming majority of the world’s population displaced by violent conflict are located in developing countries, further work and commentary that places the insights presented here in conversation with analyses of developing countries would be particularly welcome. Notwithstanding the limitations of the sample of countries included in the volume, it makes two primary contributions. Firstly, it offers key insights into the messy, contingent, discretionary, unreliable, inconsistent and unjust processes through which legal doctrine is translated into bureaucratic practice in the context of large scale, international asylum decision making systems. And secondly, the volume illustrates the effectiveness of meticulous ethnographic research into asylum determination. In particular, it is the quality of the volume’s ethnographic contributions that, I hope, will form the criteria upon which it is judged. In his contribution to this volume, Robert Gibb (drawing on Willis and Trondman 2000), gives us a clear sense of what ethnography is. More than just another method, ethnography can involve multiple methodologies that facilitate a direct and sustained encounter with research subjects. Ethnography also involves a rich written account that represents more than just a report of findings. How, though, can we recognise excellent ethnography? Although ‘it is impossible to fix a single standard for deciding the good and right purposes, forms, and practices of ethnography’ (Bochner 2000: 268) scholars have provided us with some clues about how to sense and appreciate good ethnographic method in practice (see Muecke 1994). We might expect excellent ethnography to be about a ‘worthy and interesting’ topic, for example, to be ‘sincere’ and to bring to a chaotic or poorly understood arena new insights and ‘meaningful coherence’ (Tracy 2010). We want it to be ‘evocative’, ‘engaging’ and ‘imaginative’ (Crang and Cook 2007: 2005). It should also display ‘abundant, concrete detail’ (Bochner 2000: 270). We expect ‘aesthetic merit’, ‘reflexivity’ and even—ironically enough given the subject matter of many of the preceding chapters of this volume—‘credibility’ (Richardson 2000: 254). Perhaps most importantly though, we want a story (Bochner 2000). Something that moves us, affects us and calls us ‘to action’ (Richardson 2000: 254). For Bochner (2000: 271) this is something that hits ‘my heart and belly as well as my head […] that doesn’t just refer to subjective life, but instead acts it out in ways that show me what life feels like now and what it can mean’. The ethnographies in this volume describe and partake in perhaps the central drama of contemporary society: the struggle between globalisation and territorial control, flow and stasis (Bauman 1998). Often however, the way that refugees’ role in this drama is discussed—in academic work, in newspapers and via social media—is either in dry and empty numerical terms or in ways that are trauma-heavy, pitying and condescending. Both these ways of talking about human displacement delete individual experience from the account: the quantitative fetish distils experience to numbers, targets and metrics which lend themselves to shrill and panicked talk of crises (Cohen 2002; see also Chapter 1, this volume); while the trauma fetish obscures the fact that displaced individuals are always more than refugees and have characters and life histories that precede and outlive displacement events. One of the primary achievements of the contributions in this volume, by contrast, is their poise: resisting the temptation to either simplify or sensationalise the stories they recount and the systems they describe. What this challenge to the projected universality, uniformity and coherence of the law produces is a heightened sensitivity to the contradictions and internal tensions within legal systems. This is more than simply a product of the ‘emphasis on differences’ (Bochner 2000: 268) that new ethnographies have adopted in response to the realism of traditional ethnographic approaches. It refers to ‘basic differences between how lawyers and anthropologists think’ (Good 2007: 29). Doctrinal legal scholars and legal practitioners tend to be much more concerned with attributing individual blame or responsibility than anthropologists and other social scientists, and consequently tend to assume that there is a single cause responsible for most observable phenomena, rather than multiple causes. They also tend to be more prescriptive while social scientists using ethnographic methods are more descriptive, albeit seeking to provide ‘thick’ descriptions (Geertz 1973). These differences can be associated with a penchant for deductive reasoning among lawyers and inductive reasoning among anthropologists (Conley and O’Barr 1998). Perhaps the most fundamental distinction between the two, however, concerns their different imaginations of how the law relates to society, which ‘divide fairly sharply into two distinct perspectives, the instrumental and the constitutive’ (Sarat and Kearns 1993: 21). The instrumental view sees law as affecting society by ‘imposing external sanctions and inducements’ (ibid. : 21) while the constitutive view sees law as more active in terms of ‘shaping internal meanings and creating new statuses’ (ibid. : 21). What is at stake here is the separateness of the law from social processes. Not only, for Sarat and Kearns, are the law and social life mutually constitutive, but there is also an antagonism between them that the law, if taken at face value, effectively conceals. ‘Law seeks to colonise everyday life and give it substance’ they argue (Sarat and Kearns 1993: 7), drawing in part on Henri Lefebvre (1991), but ‘law can never capture or organise everyday life… [l]aw does not descend on the everyday as an all-powerful outsider without encountering a lively resistance’ (Sarat and Kearns 1993: 8). Of all the social scientific methodologies, this couplet of antagonism and resistance has been made most visible through legal ethnography. This has, unsurprisingly, occasionally led to disagreement. At times for instance, the type of knowledge generated by ethnographers can prove incomprehensible, even irksome, to the doctrinal legal mind. Good (2007), for example, describes situations in which ethnographic evidence has been rejected by judges as ‘not evidence of fact’ (ibid. : 145), but more akin to ‘commentary’ (ibid. : 145), a frustration related to a commonly stated complaint about ethnography that ‘we cannot learn anything beyond the details of the story told’ (Flood 2005: 48). On the other hand, the juxtaposition of the different registers of legal and ethnographic perspectives, the latter affording a unique insight into the complex blend of co-constitution and antagonism between legal and social systems that doctrinal law tends to occlude, can also be highly productive. ‘When our ways of looking are incommensurable’ Bochner (2000: 266) writes, ‘we can look in the same places, at the same things, and see them differently’. For Griffiths and Kandel (2009: 158) for instance, ‘observations are important because they reveal […] multivocality’. What is most telling about their analysis is that the mutlivocality of social systems, including the voices of marginalised groups, is not easily accommodated by legal systems themselves. If legal systems cannot detect the voices of the marginalised independently then ethnography becomes a crucial means to improve access to justice. Additionally, the inductive approach that legal ethnography employs promises theoretical innovation. ‘Ethnography is constant surprise’ Flood writes (2005: 46) ‘[i]t gives rise to fresh theoretical insights as it evolves’. It is in this spirit that, in closing, I identify two key antagonisms that the ethnographies contained within this volume have illuminated. They pertain to tensions not only within the legal systems of asylum determination that our contributors have studied, but across the socio-legal divide that these systems span. In each case, they give a flavour of the multiple contradictions between legal systems and everyday social life which are often influential, and sometimes decisively determinant, of both the experiences and outcomes of the law. The first antagonism concerns the tension between the administrative pressure to be efficient and the legal and moral pressure to be fair or just. Bureaucracies by their nature exert a certain amount of ‘quantitative’ pressure (Affolter et al., this volume) over decision making systems, and it is well known that tribunals, which occupy a contested position between formal law and administrative bureaucracy, often find themselves compromised, ‘caught between administration and adjudication’ (Hambly, this volume; see also Thomas 2011). Of particular concern is when national governments that have a degree of control over the workloads of those operating within the determination system, also have a vested interest in the outcomes reached - as is generally the case in administrative law. In the context of asylum determination, this has led to various concerns (Taylor 2007), including that the speeding through of decisions can introduce unacceptable levels of chance to the process, and privilege the state as a repeat player in the system (Burridge and Gill 2017). The contributions in this volume reveal at least three further facets of this tension. The first is the complex emotionality that is bound up in it. Decision makers involved in asylum determination in Europe find themselves at the fulcrum of the passions and dramas of the global stage: not only are they required to determine the legal identities of the displaced (are they ‘deserving’ refugees or ‘bogus’ imposters? ), but also, as a collective, and by degrees, they determine the very identity of Europe itself (is it welcoming? compassionate? coherent? chaotic?). As a result, the role of determining asylum claims is deeply contested in emotional terms. On the one hand, individual decision makers are subjected to an intricate form of emotional governance (Hunter 2015; Jupp et al. 2016) that seeks to induce from them ‘[t]he proper type of emotional involvement’ (Schneider, this volume; see also Gill 2009). On the other hand, this governance is by no means failsafe: a range of influences vie for the ‘allegiance’ of decision makers—from the judgement of other professionals (will I be viewed as a ‘softy’? Affolter et al., this volume) to the different office cultures that are often to be found in close proximity even within countries. Second, the speed of processing decisions can warp the importance of certain events within the legal process. Under tight time constraints decision makers in many facets of social life, not just legal decision making, rely upon heuristics in the making of decisions (Thaler and Sunstein 2009; for a discussion in the legal field see Bone 2007). These are simple, efficient rules that help decision makers to reach a decision but that abstract markedly from the complexity of that decision by focusing on one aspect of it and giving less attention to other aspects. We know already that decision making on asylum applications rests too heavily on apparent inconsistencies in details of applicants’ stories that are peripheral to the overall account (Herlihy and Turner 2006). But in the presence of acute time pressure, single misplaced words or phrases can exert an even more disproportionate influence if they activate the triggers that decision makers have chosen to employ in order to simplify their work. This effect is vividly illustrated in Sorgoni’s account (this volume) of the 20-minute hearing at which the appellant lost their claim by uttering a few ill-chosen words at the end. Third, the imperative for efficiency can result in a perception of ‘intrusion’ (Hambly, this volume) among decision makers: the administration’s need for efficiency is seen to impinge upon decision makers’ abilities to determine cases fairly and in good time. They may become resentful and defensive - ‘we are not a statistically driven conveyor belt’ one senior British judge has declared (Hambly, this volume; although see Burridge and Gill 2017). What results is a sort of insularity. Beset by the media, national governments and supra-national laws, a siege mentality can descend upon the offices and courts of asylum decision makers in practice (see also Campbell’s discussion of government legal representatives in Britain - so-called HOPOs - this volume). Such sentiments can be especially keenly felt because there is often no verifiable evidence to help determine asylum claims, and individual decision-makers are only too aware of the gravity of making potentially life-threatening or life-saving decisions. What all this produces is the disproportionate importance of the practice of co-workers and colleagues in the determination of one’s own approach to cases (Liodden, this volume). The combination of high levels of discretion, insularity, the gravity of cases, and a lack of verifiable evidence means that localised office and court cultures are particularly influential in asylum determination in Europe—arguably more so than in equivalent jurisdictions that are neither so emotionally and politically charged, legally plural or discretionary. To understand and to change asylum decision making in Europe then, an approach that takes seriously occupational cultures in the sites at which decisions are undertaken is vital. A second antagonism concerns the relationship between consistency and variety. In the context of asylum determination this antagonism usually surfaces in the form of discussion of inconsistent decisions. These are discernible in the variance of grant rates of asylum claims from ostensibly equivalent claimants. For example, claimants from the same country, making claims based on the fear of the same forms of persecution, have been shown to have highly divergent chances of success, according to which country their claim is heard in, which regions within countries their claim is considered at, which offices within regions consider their claim, and which particular judges within offices deal with their case (Gill and Good, this volume; see also Neumayer 2005; Rehaag 2012; Ramji-Nogales et al. 2009). What the contributions in this volume illustrate, however, is the importance of considering the breadth and variety of qualitative inconsistencies in processes alongside numeric differences in the rate of asylum claims granted. Between states, although the Procedure Directive of the Common European Asylum System is an attempt to secure ‘common’ processes across Europe (Craig and Zwaan, this volume), the contributions in this volume demonstrate that there is still an extremely long way to go before we can talk about genuinely common procedures. Processual variety results from the overlapping legal regimes produced by international and national legal pluralism, the extensive discretion afforded to individual states with respect to the burden and standard of proof that they require, as well as the different legal traditions of European countries (ibid.). This can lead to considerable differences, such as allowing more appeals against negative decisions as a matter of course in some countries and not in others (see Sorgoni, this volume, for a discussion of Italy in this respect). Added to this, different states are also subject to different cultural influences, linguistic norms and media pressures, which can result in divergent interpretations of international law (Giannopoulou and Gill, this volume). Within states, the contributions in this volume have revealed additional localised forms of inconsistency. Discrepancies in the linguistic registers of decision makers and applicants can be decisive in asylum claim determination, especially in the context of the linguistic complexities introduced when the internet is relied upon for information about origin countries (Spotti, this volume; see also Blommaert 2010). The places in which law is enacted can also make a considerable difference (Gibb, this volume). Alongside marked cultural differences between work teams in different courts and centres (Liodden, this volume) the micro-geographies of proximity between applicants and the other actors involved, lines of sight and the internal arrangements of corridors, rooms and buildings can all exert an influence over the communicative practices that take place (Gibb, this volume, see also Rock 1993; Mulcahy 2007). Added to this, the characters of individual actors within the system can play a pivotal role in legal systems. Judges sometimes diverge from conventions, as illustrated by Campbell’s example (this volume) of the judge who decided to ask an extraordinary amount of questions and then deliver their judgement at the end of the hearing rather than the usual method of sending the decision by post. More fundamentally, so imbricated are legal processes by the ‘conviction’ of the judge that it has proven impossible to separate them in law, creating what Kobelinsky (this volume) calls a suspicion economy according to which cases that are not apparently legally watertight can be ushered through on the basis of shared liberal notions of compassion, whilst others attract scepticism on spurious grounds, like not ‘look[ing] gay at all’. Caseworkers can also differ markedly in their approaches to their work, often depending upon whether or not they have a legal background (Affolter et al., this volume). Even those without a decision-making role can affect the visibility and transparency of the determination process as Sorgoni’s example (this volume) of the archivist who tightly controls access to the records of Italian appeal procedures illustrates. In short, the asylum determination system is riddled with a raft of different forms of qualitative inconsistency that the usual focus on consistency of outcomes misses, but that an ethnographic approach is well suited to reveal (see Gill et al. 2018). One of the consequences of the existence of this level and diversity of inconsistency is the development of double standards in the determination of asylum claims. As Craig and Zwaan remind us (this volume) asylum seekers are expected to show ‘effort’ and ‘coherence’ during the claim making process. When they fail to do so to the satisfaction of the authorities, as both Sorgoni and Danstrøm & Whyte demonstrate in their contributions, the result can be a rejected asylum claim. Ironically however, the asylum system itself would not satisfy its own criteria, since it embodies multiple forms of incoherence as well as a lack of timeliness in several respects. Given the Herculean task of generating a genuinely common European asylum system in practice, one must ask what function the law serves in this area. While the law is conventionally viewed as regulatory in a practical sense, the stubborn resistance and infinite variety of the everyday contexts in which the laws relating to asylum determination in Europe are applied makes it difficult to accept that they achieve this objective in practice. Rather, it may be better to view the law in this area as essentially a statement of intent. If this view is adopted, then various alternative interpretations of the function of the law come into view. Optimistically, this statement of intent can be viewed as aspirational—an ideal that Europe is striving towards and that, by degrees, it is gradually realising, even if progress is slow and geographically highly uneven. Pessimistically however, the existence of a statement of intent that diverges dramatically from reality runs the risk of obscuring important features of the law as it is practised and of therefore appearing hypocritical. This divergence is especially costly when attempting to build trust with displaced people who are often vulnerable and traumatised. Once the system of determination becomes distrusted by its subjects, the very conditions of possibility for its effective and fair operation are undermined, as asylum seekers withhold and distort their own stories as a result (Danstrøm and Whyte this volume, Giannopoulou and Gill, this volume). According to this view, the notion of a common European asylum system is not only at odds with what the contributors to this volume have discovered, but could also act to exacerbate the practical difficulties of asylum determination in Europe. Needless to say, regardless of which of these two views is taken, finding ways to close the gap between the formal body of doctrinal law that is embodied in such systems as the Common European Asylum System and the everyday reality of asylum determination in practice will be paramount in the years to come. If the ethnographies contained in this volume can help to achieve this, they will be excellent indeed. Amnesty International. (2017). Greece: A Blueprint for Despair. Human Rights Impact of the EU-Turkey deal. Available at: https://www.amnesty.org/en/documents/eur25/5664/2017/en/. Accessed 5 Mar 2018. EU Observer. (2018). Hungary Plans to Paralyse NGOs Dealing with Migration. https://euobserver.com/beyond-brussels/140990. Accessed 5 Mar 2018.